One milestone was to make it to 37 weeks, since before that the baby would be premature and I would have to give birth at the hospital instead of at home as planned. I wasn’t in too much of a rush to usher the baby out, but once I hit 37 weeks I was willing to provide some gentle nudges in that direction :) So I had a prenatal massage at 37 weeks, and again at 39 weeks, with the second massage being more geared towards kickstarting labor. I had a few contractions afterwards, but nothing much. Once I passed my due date of 2/22/14, my midwives asked me to get a Biophysical Profile (BPP) and do a Non-Stress Test (NST) every 2-3 days until the baby was born. 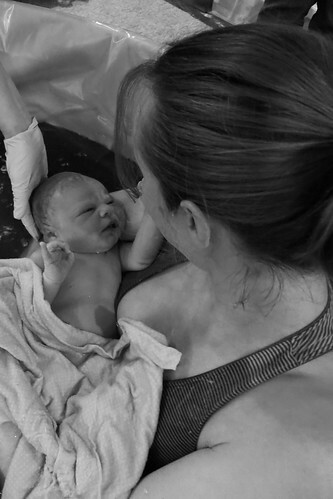 I had my first BPP on 2/26/14 (at 40w4d), which consisted of an ultrasound where the tech and doctor were looking for the baby to meet certain objectives (2 points each for breathing, movement, tone, and amniotic fluid). The baby scored 8 out of 8 for the first BPP, after initially having some problems getting it to move and seeing any practice breathing. 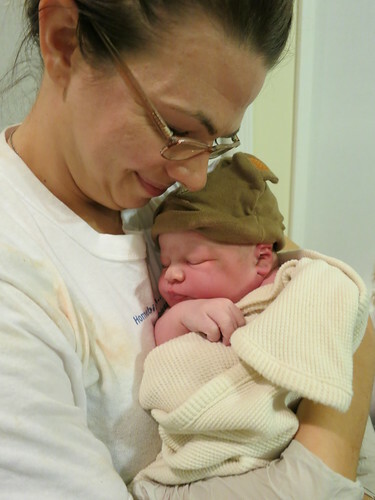 The baby’s estimated weight was 9lbs 4oz, and there was plenty of amniotic fluid, with an AFI of 12.1cm. I had an appointment with the midwives the next day (Thursday), and while I had declined internal checks up until that point, I asked my midwife to do a stretch and sweep then anyway and she confirmed that I was about 2-3 cm dilated. I went home that night hopeful that labor would get going, and while I was woken up by contractions coming about 3-5 minutes apart around 11pm, they apparently fizzled out since I fell back asleep and obviously did not have a baby that night. One of my other midwives came to our house that Saturday to do another stretch and sweep, and I was still about 2-3 cm dilated then. 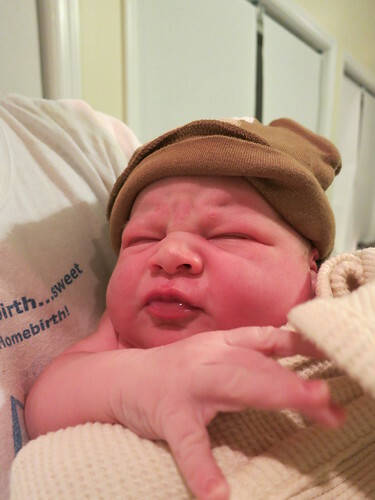 I went back to the midwives’ that afternoon, and while they were also not terribly concerned about the BPP, they did ask me to schedule another one as soon as I could to monitor the situation. They did yet another stretch and sweep, and also did an NST, which I think caused more stress for me than the baby since we had some problems getting it to move at first. The NST was basically just counting movements and contractions while monitoring the baby’s heartrate for about 20 minutes, with a reactive test having at least two instances of the heartrate accelerating by 15 bpm or more within that time. The baby was being very still, though, and I only had two contractions and detected about eight movements, which were needed to see that the baby’s heartrate would accelerate as it was supposed to when moving. We eventually got the two accelerations needed after switching positions a few times, so the baby was considered reactive, but given that I was postdates and the baby was starting to worry me with all the near-misses with its movement, I decided to go ahead and do a labor stimulation kit the next morning. I had talked with my midwives about doing the kit for about a week, but I kept delaying it since Ryan and I were hoping that I would go into labor on my own. I very well may have, but since my cutoff before a hospital induction was that Saturday (3/8/14) and I was starting to think my body just needed a little push over the edge, we decided to go for it on Wednesday, 3/5/14. I won’t get into the details of the castor oil effects, but suffice it to say it did what it was supposed to, and as the morning went on, I missed a few of the items or switched things around (since I decided that pumping and walking were most likely to do the most good, so I focused on those primarily), but I kept going until the four hours were up. While I seemed to be having more belly tightening towards the end of the morning (mainly when I was walking), I assumed they were just Braxton-Hicks rather than real contractions since they were completely painless. One of my biggest worries going into labor was that I wouldn’t recognize when I was having contractions, though, and that I wouldn’t notify everyone in time. So even though I was almost 100% positive that the contractions were just Braxton-Hicks, I decided to try to time them anyway, just in case. To my surprise, they were actually coming pretty consistently about every five minutes… so although I had just emailed my mother-in-law to say that I doubted anything was going to happen that day, after timing a few contractions, I started to believe maybe something was actually happening! I even IMed Ryan at 11:45am to ask him if he remembered me finding the contractions painful with Josie when they were five minutes apart. He didn’t think I had either, so that made me a little more suspicious that these contractions could actually be the real thing. At 1:30pm, I IMed Ryan again to tell him I was a little more sure that I was actually having contractions rather than “just” Braxton-Hicks. They were coming every 3-5 minutes at that point, lasting 30-50 seconds each, then dropping down to about every 90 seconds when I was walking. A couple of the contractions were a little bit more uncomfortable, but the rest were fine. However, after another hour, the contractions were getting consistently more uncomfortable, and I was starting to sway and vocalize/focus on my breathing during them. I IMed Ryan again at 2:30pm that I was waiting to see what K. would say once she got here, but he may want to consider coming home early. He thought he might as well (funny in hindsight how nonchalant we were about it! ), so he said he would pack up to head home soon. After continuing to work for a while longer, sitting on a physio ball and circling my hips during each contraction, I texted K. again at 2:50pm to let her know the contractions were now coming every 2-4 minutes, lasting about 60 seconds each, and were more uncomfortable. K. had gotten held up, but texted back that she was on her way, and she arrived just after 3pm. In the meantime, I started having some lower back pain, the contractions were becoming more painful, and I could feel a lot more pressure on my pelvic floor. I was still afraid that I wasn’t actually in labor so I didn’t want to make everyone come out for nothing, so I had been telling C. to wait until K. arrived before heading over herself. As soon as I opened the door for K. (who was on the phone), she announced, “We have rosy cheeks!” I was in the midst of a contraction then, so she watched me for a couple of seconds and that was apparently enough for her to confirm I was, in fact, in labor. She told the student midwife that she was on the phone with (J.) to come on over, and also let C. know to head over too. I finally gave up working around 3:15pm, and with Ryan on his way, I called my mom around 3:45pm to let her know what was going on, since she was going to be watching Josie. C. arrived at 3:50pm, with my mom and J. both arriving at 4pm, and Ryan coming home shortly after that. K. and J. set about getting everything set up, while I went back to chugging water and bouncing on the physio ball. Contractions were getting more intense, and I was continuing to circle my hips on the ball and doing some sighing/vocalizing during the contractions. My contractions had slowed down with all the commotion of people arriving and getting set up, so just around 4:30pm, K. asked me to choose between walking or pumping to pick things up again. I selected walking, so I headed upstairs with C. for some super brisk walking on the treadmill. That got my contractions going again, with them starting out about 3 minutes apart and 45 seconds long, and after maybe 10 minutes of walking, they dropped down to about 90 seconds apart and over a minute long each. After finishing up with walking, I laid out a yoga mat in my bedroom and did a few rounds of cat-cow pose to try to get the baby into an optimal position. After a few rounds, I realized that I was freezing for the contractions themselves, so I asked C. if I should be trying to continue moving through the pose during the contractions too, and she told me to go for it if I could. So I gave it a shot, and heard an audible “pop!” with the very next contraction, right around 5pm. I looked at C. and said that I was pretty sure that was my water breaking, although I felt next to nothing come out. C. got a tester from K. to check, and sure enough, it came back positive! 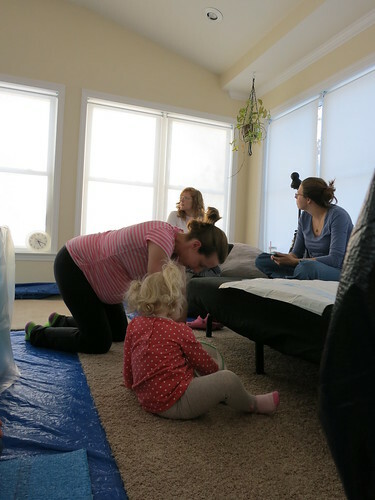 Soon enough, I began having more problems getting through the contractions, and found that going to hands and knees and doing big hip circles helped. 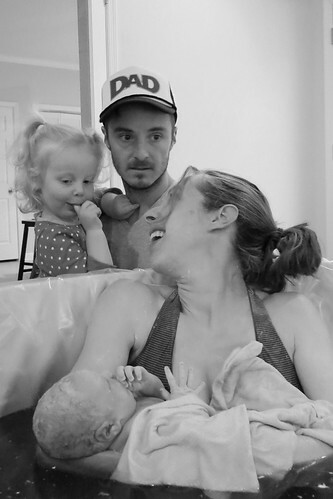 I never really felt like I got a good rhythm going, though, and so I didn’t feel that I was relaxed and really staying ahead of the pain as I remembered being so important during my labor with Josie. In hindsight, I think it was hard for me to do the “duh face” (the quickest way for me to relax) when I wasn’t laying down, and since I labored most of the time on my hands and knees, I don’t think I was fully able to relax through the contractions. I also was feeling just a little nauseated, and was wearing my Sea-bands and toting my specially-purchased basin around with me just in case. Ryan picked up Josie around 5pm, and then we were all gathered in the sun room as K. and J. continued making sure everything was ready. Josie seemed completely fine with her house being taken over by strangers, probably because they brought food :) We were all just sitting around, snacking and chatting, with me sitting on the ground next to the futon and then going up onto hands and knees for each contraction to circle my hips and breathe through it. By 5:30pm, I had moved to lay on my right side on the futon with my head smushed up against a pillow. This was really not very comfortable but I just couldn’t focus on relieving that discomfort by moving a couple of inches when I was dealing with the bigger issue of my contractions. I was able to relax a little more in this position during contractions, but still didn’t feel like I was coping as well as I thought I remembered doing for Josie. I started asking for Ryan and C.’s support more, and having them provide more consistent counterpressure really helped. I was still eating some oranges and trail mix and drinking coconut water in-between contractions, and I believe I commented at this point about how much harder the contractions were already from what I was expecting. K.’s notes from this time corroborate that, indicating that I was serious and working harder. She assured me I could get in if I wanted to, so I took one last bathroom break at about 5:50pm. It took a little longer than expected to get back to the sun room, since the pressure got to be too much and I ended up taking a couple of contractions on the bathroom floor on my hands and knees before I was able to get back up (with lots of assistance) and make my way back to the sun room. K. and J. checked the baby’s heart tones then and confirmed everything still sounded good. I felt another contraction coming on then, so I quickly dropped back down on my hands and knees, but maybe still wasn’t ready for that one. I said “ow” and was vocalizing more (whereas I had been mostly calm before with just some quiet vocalizations) and circling my hips, and afterwards I noted that the contraction seemed harder than the ones before I had gone to the bathroom. As soon as that contraction ended, I popped back up to shuck off most of my clothes before another contraction washed over me, and sank into the water. The water was definitely a relief... at least for a few seconds until the next contraction started ramping up :) Within just a few minutes of getting into the water, I suddenly felt myself pushing at the end of a contraction. I panicked a bit and asked why I was pushing already, it was too soon! K. and J. assured me that it was fine and not too soon, and K. asked me if I wanted to be checked again. I questioned whether I could really be in transition already (I had only been in the water for a few minutes - I was supposed to be settling in for the long haul, not already almost done! ), but agreed to be checked. At 6:02pm, just 8 minutes after entering the tub, K. confirmed that I was complete and could push. I apparently blew right through transition, having none of the emotional signposts that usually mark it (feeling like I can’t go on, that I need pain relief, etc.) - there was just no time! As the next contraction started up, I actively began pushing, with Ryan at my head and J. and C. behind me to monitor things and provide counterpressure. I was just trying to push the baby out as quickly as possible -- and apparently as loudly as possible -- without any regard for breathing or effectiveness. I was yelling by this point, and felt a little bit worried that I was expending energy by yelling rather than focusing my energy into my pushes (although when I mentioned this to K. later, she said she was fine with it because my labor could have stood to be slowed down a bit!). I was able to calm myself back down between contractions, and J. and K. checked the baby’s heart tones again to confirm the baby was tolerating pushing fine. 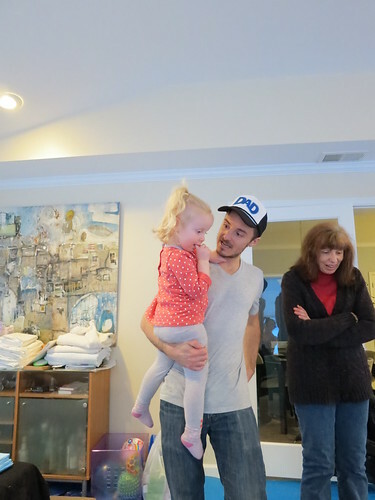 I couldn’t really feel the baby moving down, but I think in the back of my mind I knew things were progressing, especially since I didn’t have the feeling that I was pushing against a wall as I did for most of the hour I pushed with Josie. 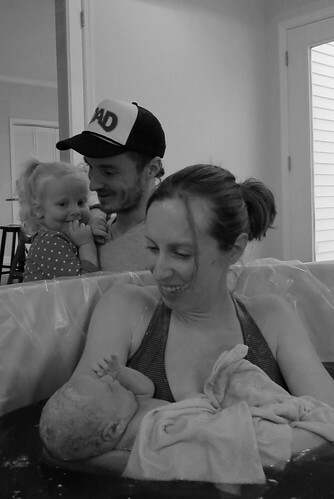 Two minutes later, the next contraction started, and while I was still feeling pretty out of control of the situation and my body, I could at least feel the baby’s head moving down now, and felt it stop just before it was free of the birth canal. I don’t remember the ring of fire being that bad this time, and then suddenly the head was out! I pushed through the next contraction that followed a minute later, but wasn’t able to push the rest of the body out yet. I had been pushing on my knees while hanging over the side of the pool, but after that last contraction, K. asked me to get into runner’s position with my right leg up to deliver the shoulders and the rest of the body. 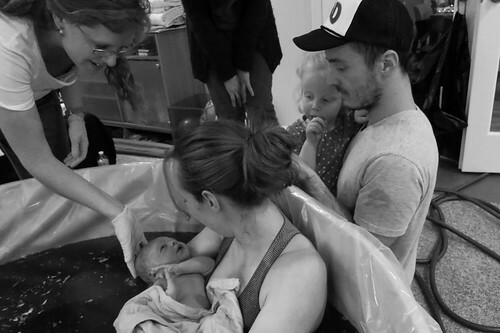 I was quick to comply, since I know that position is usually recommended to help with shoulder dystocia (when the shoulders get stuck and can’t be delivered), which was something I was a little worried about anyway, given the baby’s estimated size. And so when K. then told me to go ahead and push my baby out, although I’m pretty sure I wasn’t even having a contraction then, I pushed as hard as I could anyway. My yelling became more primal, guttural and just more mad towards the end of that push, and I suddenly felt much stronger and more confident in myself than I had been the rest of the labor. I had even made the comment earlier in labor that I was weak - it was intended as a joke, but I think it belied some concerns I had anyway. 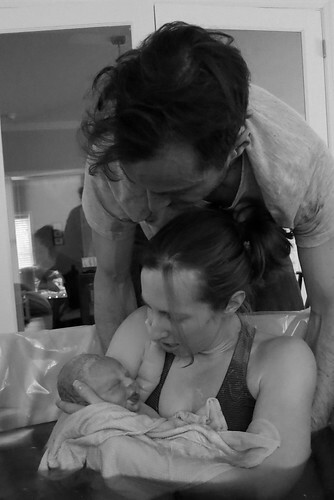 I knew I was capable of having another natural birth, but somehow just felt less than 100% confident in myself - maybe that I wasn’t strong enough or truly committed enough to undertake a home birth. But with that last scream before pushing my baby out, I did feel strong. I was done with the discomfort and I was READY to push that baby out. I took a breath and then began to push again, and J. assisted, giving the baby a little twist (which was also the only time that I felt actual pain rather than just super intense discomfort). I then had a sudden sense of relief and time standing still for a brief moment, before K. told me, “Reach down and get your baby!” I immediately scooped the baby up from the water, hugged my baby to my chest, and started cooing and accounting for all of the present body parts (you have feet! Look how cute!!). I sent Ryan upstairs to get Josie, and she and my mom came down to see the new addition, just five minutes after Audra was born. Josie seemed a little unsure, and smiled a bit but mostly just stayed behind me, sucking her finger. K. and J. did Audra’s assessments, and she scored 9/9 on her Apgars, and measured in at 9lbs 15oz, 21” long, with a head circumference of 14” and chest circumference of 15”. They also noted a possible low frenulum, which was something for us to keep an eye on in case she had difficulty nursing. After Audra’s cord finally stopped pulsating around 10 minutes later, K. asked if we’d like to cut the cord. R. and I both deferred, so my mom did it instead :) I was so proud of her, and really liked that she got to participate in the birth as well (beyond taking care of Josie). I then handed Audra off to Ryan so I could focus on pushing out the placenta. And here is where things get pretty hazy for me, so I’m relying mainly on K.’s notes for this part. After pushing for a while in the pool without any luck, I got back out and was laying on the futon at about 6:20pm. I delivered the placenta a few minutes later, and I assume I started bleeding pretty heavily then, since I just remember a sudden burst of activity as the midwives started mixing up some herbs for me to drink. Ryan had apparently asked if I could try to nurse to see if that would help my uterus clamp down, but I only vaguely remember him bringing Audra over to try to get her latched for the first time :( The next several minutes were a blur of discomfort as the midwives did what they could to stop the bleeding (which I won’t get into, but it was not pleasant), with J. also holding up my legs. Things continued to get fuzzier for me, and I started having buzzing in my ears and getting sick. I next remember K. saying to call (which was apparently at 6:35pm), and then her letting me know that the EMTs were on their way. I was still laying on my back at 6:40pm, and was able to have some sips of water while K. and J. continued monitoring my bleeding, vitals, and responsiveness. I tried raising up to a slight upright position, but immediately felt dizzy and nauseated, so I was laid back down on my back with J. continuing to elevate my legs. K.’s notes indicate I was still responsive and stable, although I really remember very little of this time. The first EMTs arrived around 6:45pm, with about five firefighters suddenly appearing in the sun room. K. was trying to keep me awake by asking questions, like how old I was and where I lived, which I was a little disturbed to hear myself answer in a singsong voice like this was all a game. More EMTs trooped in as the two ambulances arrived, but they weren’t able to give me fluids unless I was going to transfer to the hospital, so everyone was just waiting to see what I would decide. I was feeling a little better by then, but as soon as J. lowered my legs from her shoulder to her waist, I started to fade again. That didn’t make me feel too optimistic, so I decided to transfer (and K. later told me that if I said I didn’t want to transfer, that she would have overridden me anyway). As soon as I said I would transfer, the EMTs immediately got an IV going, and then started working to get me moved and strapped onto the stretcher to transport me out to the ambulance. It was pretty cold out that night, but as they carried me down our front steps and across the yard, I remember looking up at the stars and taking deep, refreshing breaths in of the cold air, telling them that it felt great and I felt so much better. We left at about 7:35pm, and K. rode in the ambulance with me while Ryan stayed back at the house with Audra, J., my mom, and Josie, with J. finishing Audra’s assessments and doing some cleanup. Once we got to the hospital, the EMTs unloaded me from the ambulance and K. and I were set up in one of the L&D rooms. Dr. H. came in with a few nurses to get started on me, and seemed less than thrilled with the situation. There were a few negative comments and a strange dynamic with the doctor and nurses as they tried to piece together what had happened since, at least from my perspective, they wouldn’t acknowledge K. unless they absolutely had to, so instead we played an odd game of telephone as they asked me questions, which I then would have to ask K. to answer since I had been so out of it at home. Regardless, there was a lot more mashing of my stomach as they tried to get my uterus to contract down, as well as other unpleasantness as they tried to stop the bleeding and then repair my second degree tear. They also ran a CBC at about 8:30pm, which showed (unsurprisingly) that my white blood cells were elevated, and red blood cells, hemoglobin, and hematocrit were low. Dr. H. eventually recommended a blood transfusion, which I agreed to, as well as a few rounds of antibiotics given all the opportunities for bacteria to have been introduced while everyone was trying to get my uterus to cooperate. I was also given methergine and cytotec to try to help my uterus cramp down and stop the bleeding. I am normally vehemently opposed to cytotec (given that I had taken that for my first miscarriage, which -- after birthing two babies now -- is still the most painful experience of my life), but I wasn’t going to fight them in this circumstance, so I accepted their recommendation with a sense of dread of the pain and cramping that was to come…. except it didn’t. I actually didn’t notice any change in the way I felt after the cytotec. I certainly was having cramping, but it just seemed to be the normal, post-delivery kind. Sometime during all of this, Ryan, J. and Audra came into the room. I vaguely remember seeing Audra with a cute little owl hat on, and thinking how good she was being as they all hung around the perimeter of the room while the doctor and nurses worked on me. 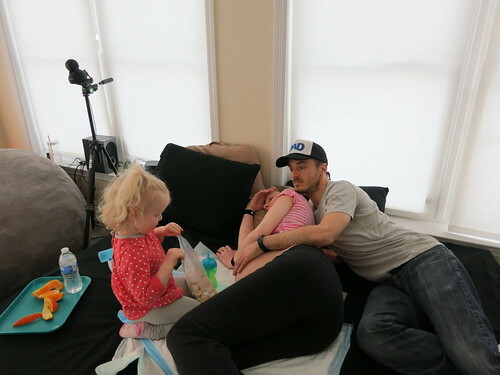 Since I didn’t really get a chance to nurse at home, I was starting to get antsy to try to feed Audra again, but then the nurse suggested we give Audra formula instead, saying that it would be too hard on me to nurse with everything else going on and then we could feed her sooner. I was still pretty out of it, but was able to rouse myself just long enough to firmly shoot down that suggestion, since it was only going to be a little bit longer and I was not concerned with any potential delay nursing could have for my overall recovery. It just seemed like a solution to a short-term problem that could have a much longer-term, negative impact on breastfeeding, which is very important to us. The nurse was obviously annoyed, but agreed I could nurse after the last unit of blood was finished. 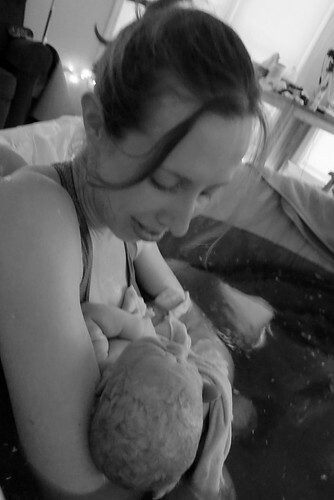 That finally happened around 11pm, and so I tried to nurse Audra then. She latched on and nursed for a bit, and we finally got to get settled for bed. We swaddled her and put her in the bassinette, somehow forgetting that we can’t just plunk a newborn down and have her fall asleep :) So after a bit of rocking, she went back in asleep, and then slept very restlessly - with lots of kicking and grunting - for a couple of hours. And then she woke up, and was no longer the quiet, content little baby she had been for her first few hours. 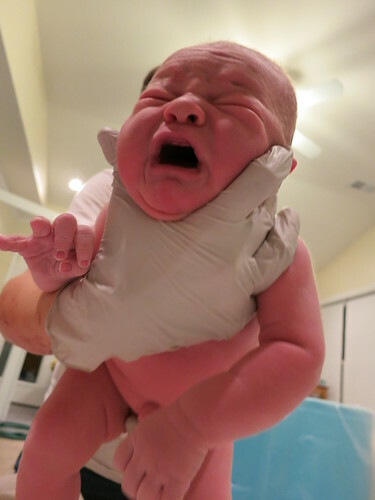 I tried to nurse again, but she just seemed really mad about the whole endeavor and continued to scream and cry for the next several hours while we tried our best to soothe her. We had the absolute sweetest nurse at that point, and she asked us a few times if we’d like her to take Audra for a bit so we could sleep, since Audra wasn’t admitted to the hospital and therefore couldn’t go to the nursery. We finally agreed around 4am, and we were so grateful for the hour of sleep that she was able to get us. When the nurse brought her back, I nursed again, and finally just left Audra on my chest with my hands locked over her to keep her in place. Our nurse had warned me that nursing in side-lying position and cosleeping weren’t permitted at the hospital (the beds just aren’t safe for it), but after all of the hours of screaming, I was willing to risk it. So I spent the next several hours dozing off and on so that I could be awake (and pretending to nurse) each time the nurses came in, but at least Audra finally settled and got some sleep. My mom dropped off and picked up Josie from school the next day (Thursday), while we spent the day at the hospital nursing, trying to sleep whenever possible, and being monitored. Ryan went back to do dinner, shower, and bedtime for Josie that night, and Ryan’s parents came to visit while Ryan was gone, which was so nice to have them come meet Audra. 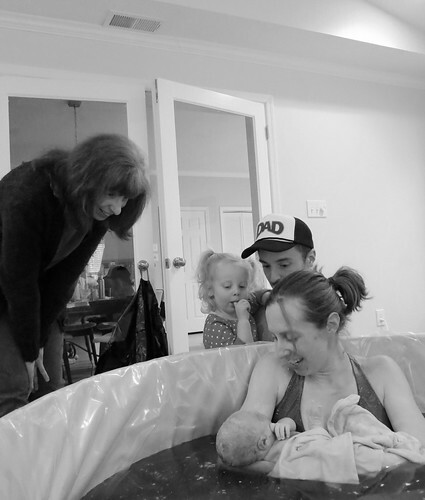 After they left, I continued to try to nurse, but was just feeling weak and cumbersome, and Audra was still crying a lot through it which made the whole situation so much more stressful. I even managed to accidentally hit the call button for the nurses once when I was flipping Audra around to try to find a position she would tolerate, and while I told them I was ok, I was so thankful when a nurse came by later anyway and changed Audra’s diaper for me, since I had just been struggling to get out of bed to take care of it myself. I was also still having antibiotics run and my temperature had gone up during the transfusion, which was to be expected, but still concerned Dr. H. My hemoglobin levels had dropped too much between my morning and evening CBCs, so while we originally thought I’d be discharged that evening, they decided to keep me in L&D overnight again and likely through the next day. So after Josie was in bed, Ryan came back to the hospital and we settled in for a repeat of the night before, just minus a nurse taking Audra, and with me just having her sleep on my chest earlier in the night. The new doctor on call, Dr. J. , seemed no-nonsense but also more open to talking to us. When she mentioned the fever I spiked, I pointed out that it never was a fever since it didn’t get above 100.4. When she heard that (and confirmed it), she agreed to try to get me discharged in the morning, so long as my counts didn’t drop too much. The next CBC was run at 6am on Friday, and it showed that my counts were acceptable - we were free to leave! We got home about 9:15am, and it was so odd when we walked in the door - it’s not that the significance was as Audra’s first introduction to our home, since she had obviously been born here, but given all that transpired the previous day and a half, it felt like we had all changed profoundly since the last time we were there. 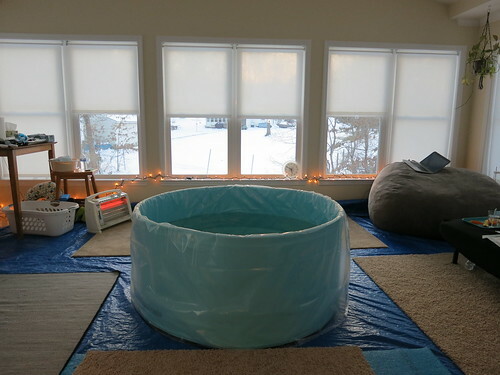 I still felt quite weak, and gingerly set about settling in again, but when I walked past the sun room where Audra was born, and our bedroom where my internals and stretch and sweeps were done, and where my water broke… all my emotions built up and came flooding out of me as I started crying. 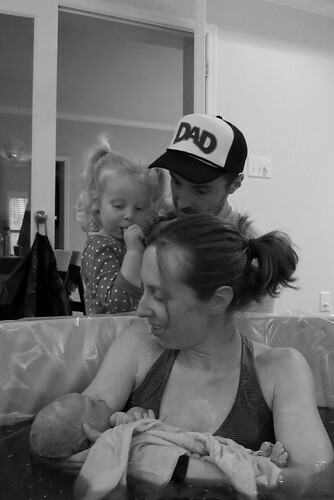 It was overwhelming to think that we had brought another wonderful baby into the world, and then the relief hit me: all the worries about Audra being ok throughout my pregnancy and her birth, me having to be induced if she didn’t come soon enough, the miscarriage fears, the heartbreak and trauma of the fertility treatments and lost babies that came before her… it was all over. We were done. Done, done, done. Seven years since we started trying to build our family, and we now had two healthy babies, with the icing on top being that we were able to have one at home as we’d hoped for from the start. 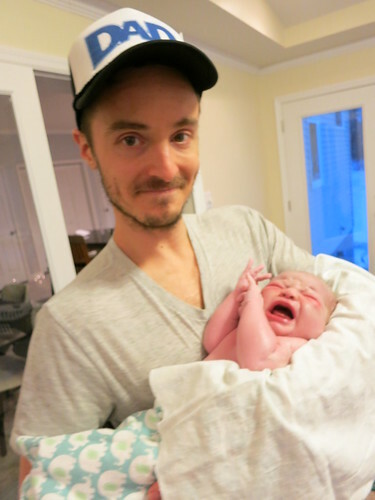 I was expecting to feel elated and overcome with love from having a new baby, and along with those feelings, the sense of relief in having that weight lifted was surprising and powerful. While I wouldn’t trade my pregnancies (which I loved) or the magical moments when we first met our babies for anything (which are indescribable), I am so happy that we are now done with that phase of our lives and can now look forward to the next one together.